If you formed your first baseball memories in the 1980s, you’re watching a very different game than the one you grew to love as a kid. The ’80s were the time of Rickey Henderson becoming the greatest of all time. Tim Raines drove opposing pitchers insane. Vince Coleman swiped 100-plus three years in a row. The home-run era changed all that. Managers began playing for three-run homers instead of deploying the running game to generate offense. 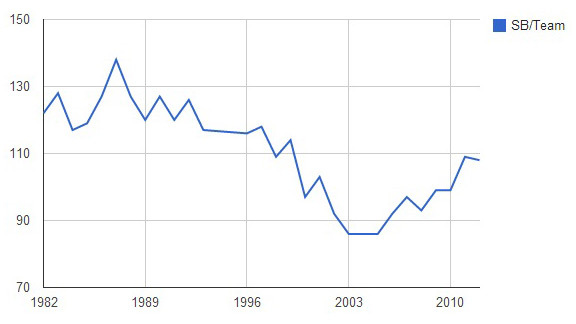 Per-team stolen bases plunged 37.73 percent from a 1987 peak to its trough in 2003 through 2005. The strategy made sense given everything that was happening in the game in the early-to-mid-aughts. But at the very least, the go-go ’80s were far more aesthetically pleasing than the three true outcomes game that dominated the PED era. Slowly, things have started to change. Base stealing remains well off its highest ’80s levels. But it’s still up 26 percent from that three-year bottom last decade (see chart below). There might be hope for more, too, with a new generation of speed demons led by Mike Trout, Ben Revere, Desmond Jennings and Billy Hamilton (who just set the all-time record for minor league steals with an incredible 155 swipes) joining veteran artists like Michael Bourn and Coco Crisp. That’s good news not only for fans of daring baseball, but also for students of the game. For all the talk about baseball’s complex strategies, subtlety, and nuance, it’s fundamentally still an incredibly simple game. Pitch ball, hit ball, catch ball. Granted, there are pitchers like Brandon McCarthy and hitters like Joey Votto who are students of the game, going well beyond the chuck-and-duck or grip-it-and-rip-it styles favored by many others in their positions. But there’s something about the interplay of pitcher and base runner, the holds and looks over, leads and jumps, the constant cat-and-mouse game between a mindful hurler and a master thief that makes the hair on the back of your neck stand up. With that in mind, I set out to find one of those master thieves and have him walk us through every step of the base-stealing process. Oakland’s Coco Crisp was happy to oblige. Poring over a series of videos one early morning in Phoenix, Crisp described the cues he picks up from individual pitchers and the weaknesses he can exploit. Moreover, he explained how a player entering his 12th major league season can be a better base stealer now than when he was younger and much faster. Crisp’s career high in single-season steals came in his age-31 season in 2011, when he swiped 49. Despite nagging injury troubles, Crisp has been ludicrously efficient on the base paths over the past three years, stealing 120 bases and getting caught just 16 times (88.2 percent success rate). Thanks to MLB Advanced Media and Bloomberg Sports for making the videos available, and to Coco Crisp for indulging a bunch of nerdy questions. Here’s that conversation. I try to pick up something off of every pitcher. It might be different, it might be a move with his front foot, or something else. With lefties obviously it’s a little more tricky. With this particular situation, I believe that I was looking at his head. And that was his first movement home, was when he gave a sharp, quick look home, which gave me a few ticks before his front foot lifted. And as soon as he picks up his foot, I take off … or I try to take off. Normally on this particular play it’s a slide step. I wouldn’t go unless I caught a sign that was a little earlier than his front foot going toward home. Slide step and a good throw, good chance you get thrown out? Yeah, and that’s a chance I don’t want to take. I visited with Pete Rose over the weekend in Vegas, as the Hit King signed autographs at the Art of Music memorabilia shop in Mandalay Place. We’ll publish the rest of the interview sometime in the next couple weeks. For now, here are a few of his thoughts on how he approached stealing bases, and … well, you ask Pete a question, he just tends to start rolling. “I only stole 198 bases. But in my case, I would have hurt the team if I stole bases. Let me explain. I lead off the game or the inning and I’m on first. First or second pitch, I steal second. Now because I stole second, Joe Morgan is hitting. He hits a ball that would have been a base hit to right field, now it’s a ground ball to the first baseman because he’s not holding me on. And I was the best, I think, in the league at going from first to third. So if I stay there and he gets that base hit, I go to third and the next pitch he’s on second. Now [Johnny] Bench and [Tony] Perez have second-third, no outs. “[Tim] Raines, he was a good base stealer when it meant something, too. Morgan, because of the wear and tear on his body, really picked his spots. They meant something. He didn’t do it for statistics. Not that that’s bad. “I didn’t do the work like Morgan and them did. I knew if there was going to be a base hit to any field in the game, I was going to go to third. I wasn’t the fastest runner but I guarantee you, in the history of baseball, there’s one guy who could get there faster than me — Willie Davis, Dodgers. He had such long strides and he could run. There’s a lot of guys that can outrun me but I would leave home thinking about a double when I hit a single and that’s why I got 750 doubles, not because I was tearing the walls down. You don’t take 10 steps out of the batter’s box and decide it’s going to be a double, you take one step out. That’s when you’re thinking double. If he catches it, you go back. If it’s a double, then you think three. But I didn’t study guys’ moves or anything. I would steal, like, if Morgan had two strikes, they throw me out, he’s leading off the inning. So what? This one right here, whenever he really holds the ball, he doesn’t pick over. He’s a guy that picks over on the way up. Every now and then you’ll get an unconventional thing from the pitcher you’re watching. He might pick over as he has come set. But more times than not, he’s a guy who will come set, and then hold, hold … and then he’s going, then he’s going home. If he comes set and picks over, you get back. But if he comes set and holds, then you can take that extra little step or take that chance to get out there. And this was also somewhat of a slide step. So for me to still be able to steal off of him I was going to need to get a good jump. So I was actually going on that first one, but then he held a little longer, and I stopped. Surprised nobody yelled from the dugout! Are you a big video guy then? Yeah, that’s my main thing. A lot of guys like to see what kind of pitches a pitcher will throw, for hitting. Since I don’t care about that [laughs] … I just like to go up there, see the ball, hit the ball. I don’t like too much information for hitting. But for base stealing, I can never have too much information. So I like to go in there and see what their first movement is, check on their times [to home]. With base stealing, the biggest thing is knowing what time you can steal off of a pitcher, and being patient with that. I just try to collect as much information as possible so I have a higher-percentage chance to steal. Are you scouting seven or eight pitchers a game then? The starter and all the possible relievers? No, I study the starters, and as relief pitchers come in, if other guys get on base, I just stand on the rail, look at ’em and try to pick up on certain things they’re doing in the moment, during the game. And I’ll try to give my pointers, the things that I just learned, to the team as well. When you’re playing poker, if you have a tell, you fix it. Do pitchers ever switch it up on you? Every now and then, every now and then. But for most pitchers, it would be hard to change what they’re doing and still feel comfortable. I know for me it would be hard to come up to the plate, and say I’m susceptible to a slider down and in, so OK, I’m going to change my hands up so I can get to that slider down and in. But that might mess up something else. So you just don’t swing at that slider, I guess. But for a pitcher, it’s similar I would think, where if you’re used to loading heavy on your back leg and bending your back knee first, it would be hard to not do that, and risk changing your mechanics. So you can usually rely on pitchers to keep doing what they’ve always done. Betancourt. We played together in Cleveland, I know his moves well. Is it just the head … pitcher looks back to second, looks forward, then you go? Well, no, not necessarily. There are a few guys who are able to look up, and pick up the plate as they’re going home. Those guys make it a lot tougher to steal. Betancourt’s not a guy that likes to pick off a lot, especially to second. I knew he had a high leg kick, which is like a 1.8 [seconds to home]. There’s, like, a little bounce in his step. He doesn’t just do a head turn. He has a little head move where he drops it down and then goes to the plate. So that gives me even more time to go. A lot of guys, from second, are taught to give multiple looks, to switch it up. But sometimes they just give you that one look. And when they get in that one-look rhythm, when they do that, it allows you to go off that look instead of the front foot. And when they do that you have to be careful. Because if you go off that first look, then you have to at least start running with your head up. That way you can stop and get back if they don’t go home. Betancourt is a closer, so he might just be thinking about blowing guys away. Do closers pay less attention to runners, are they worse at holding runners on? Yeah, yeah, that is true. Closers are closers for a reason. They anchor the staff because they have the best stuff. They rely on being able to get people out versus picking people off. A little more like, crafty lefties, righties who might need that pickoff move to keep that runner close to that double play — it’s a little harder against them than it would be against a closer. Are pitchers paying more attention to base stealers, or less, given this isn’t the game of the ’80s, and guys don’t run as much anymore? As a team, we have been a little more risky than in the past few years before I got here. Which is a good thing, because the team having confidence in us gives us more freedom, then we get even more since we’ve been so successful. Which pitchers are the toughest to run on, and why? For instance, James Shields picks off a lot of runners for a righty. What does he do to make that happen? Shields is a guy who’s one of those quick-pick types. He has a quick move. But he doesn’t necessarily hold and pick. He holds to keep you off-balance. And then he’ll go at random times. Which is also a good technique. He does that funny look at you. Then he likes to spin and throw, and he’s pretty accurate. Are there guys you just won’t run on? On my team, unless it was, like, a situation where they just really needed it, I probably wouldn’t run on Travis Blackley. Brett Anderson, I probably wouldn’t. What about their approach makes you say you wouldn’t run on them? It just looks the same. We did some simulations out here with Blackley. From center field, I can see his body coming toward first base when he’s picking off. But from first base, you can’t pick that up. I think he might be the best in the game, to be honest. That was a changeup … wait, it was a fastball. Who knows, it might have been a changeup. [Laughs.] But another thing, too, from second base, unlike where you’re on first base, you can see into a pitcher’s glove. I’ve never been someone who looks into a catcher’s glove and steals signs for the hitter. I’m not a guy that ever peeks in for the signs, because I might confuse myself. But one thing I might do is see the grip of the pitch. And if I see him gripping a changeup, then I know I have a better chance to steal this base. Right, because they’re not going to try to pick you off by throwing a changeup to second base. Yes, though sometimes they might get a little crafty, change the grip, then try to pick you off. But if they do go home, with the changeup grip, I’m going to have more time to steal … they might even bounce it. Same thing with the curveball, so I have a better opportunity to steal that base. In the video of this play, Jim Palmer’s saying you’re going on first move. Is that what it looks like to you? I believe with this, it was his first move, yes. But here, if I saw he was standing with an open crotch, where I could see the inside of his thigh, that means he’s going home. Versus when he’s coming over to first, he closes up. Sometimes that varies with different pitchers. Some pitchers are more closed when they come home, and leave it open to come over to first. There’s also the back toe with lefties. And this is one of the most common mistakes they make. When they go home, they dig in their back toe. When they come over, it lifts up. They come up on their back heel to come over. You can see that if that’s what you’re focusing on, if you don’t have anything else to go off of. Sometimes you’ll see the front toe of a pitcher pointed down when he’s coming home, then if you see it up, it’s more relaxed, that means more likely he’s coming over to first. There’s also, like I said, the crotch, you can look for that. But there are definitely some things you can look for if you want more than just to focus on first move. Slide steps, you’ve got all slide steps! [Laughs.] See, normally I don’t go on slide steps, and here you have me going on a bunch of them. More times than not, I won’t go on slide steps. Willie Wilson ranks 10th among all modern-era players with 668 career stolen bases in the big leagues. He was a catalyst for the great Royals teams of the mid-’70s to mid-’80s, teaming with George Brett, Frank White, and some deep pitching staffs to win six division titles, two AL pennants, and the 1985 World Series. Here’s what he had to say about the art of base stealing. “Anybody can be a burner. The burning thing is great if it’s going to make you successful. But you can only be a speedster for so long. If you go on first move every time, you’re going to get thrown out by the time you get to Double-A, because pitchers are smarter. So you have to learn the differences in pitchers. I hardly ever used a clock. I just basically looked for something that was … abnormal. Something that was different than what he does going to the plate. If he does something different, then he’s coming to first. “I’d watch the pitcher, mostly didn’t care about the catcher. If I got a jump on the pitcher, in my brain, no way the catcher was going to throw me out. Up until about Double-A I was pretty much a burner. I just ran, and kept running, until they threw me out. But as I got older, the pitchers were better, had better moves. I started wanting to steal bases to win ballgames, not just for the sake of stealing bases. “I had a great base stealer to teach me, Amos Otis. Amos would always take me down to the end of the dugout, right by first base, we’d sit all the way in the corner and watch a pitcher’s move all game. ‘You see this? You see that?’ he’d say to me. One time, he showed me how a guy’s pants wrinkled. ‘See the wrinkle? You can go.’ It was amazing, I couldn’t believe he could see that. “There were some easy guys to steal off. The easiest was Ron Guidry. When he threw home, he ducked his chin because he was a power pitcher. He was really easy to steal off, but the problem was, you had to get on! [Laughs.] Nolan Ryan was a power pitcher but he got smarter and smarter. Nolan when you got on, he threw over, he got better at holding. But his leg kick was high, so you could go. Power pitchers are usually the guys you can get good jump on. Higher leg kick, they want to throw as hard as they can, so they’re longer to the plate. “One guy who gave me a lot of trouble was Tommy John. He hardly [strode] to home plate, it was a short stride, and he threw over a lot. It all depended on whether I figured out the move real quick or not. Sometimes I would step out far enough just to make him throw over, to see what he was doing. It’s amazing what you can see in a split second, like a throw over. He did this when he came over, did that when he went home, then you start to figure it out. And I might not take off right away, because you want to see the difference. Then maybe you take advantage later in the game, when the run means more. “The game was played on turf back then. Tim Raines, Vince Coleman, me, we all played on turf. Turf was prevalent all over, so it was a quicker game. You tried to use your speed and your knowledge of pitching to get a stolen base, get into scoring position to win the game. Tim, Vince, and I took pride in doing that. But isn’t the slide step the most common move, now that pitchers have been taught it, it’s someone like you on base, and it’s an obvious base-stealing situation? Yeah, if it’s a situation where I might go, that happens. This was a curveball, so that helps. But it looks like I’m just going on first move here. But with slide steps, sometimes they’re a little deceiving. His slide step might be like a 1.3, where for other pitchers it might be like a 1.1 or a 1.2. [A’s first-base coach] Tye [Waller] is giving me the times over here at first base, but sometimes it’s just deceiving. Where you could have a guy who’s using a slide step but it’s still pretty slow anyway, like a 1.35. So for me it’s, “1.35? OK, I can get that.” So you’ve gotta know that you’re capable of getting the base easily. I feel like I can make this all the time, if you give me a 1.3. You give me a 1.2, all right, I have to do everything perfect here. Give me a 1.1, I’m not going. Do you have a success rate in your mind when you’re deciding whether or not to run? I just don’t want to get thrown out, that’s my main thing. My main thing isn’t how many bags I can steal. It’s how successful I can be, so I can steal and still have a large amount of successful stolen bases. I hate getting up and running back to the dugout. I think early on in my career, I wish I had the green light like I do now, but I didn’t have the green light. It’s a lot harder to steal bases as a base stealer when you’re being told to steal at this moment. You get the steal sign, and you think, “OK, this is probably my only chance to steal in the whole game. I’m going no matter what. I’m just going to go.” And then it’s a slide step, you’re going, and you’re supposed to hold up, but you know you might not get another chance, so you keep going. It’s a lot easier when you have the freedom to go on any pitch. Luckily I have the green light here, I’ve had the green light since Boston. Oh yeah. I was running like a 4.2 [40-yard dash] or a 6.2 [60-yard dash] when I was younger. Now I’m probably around … I don’t even know what I’m around, but I’m not a 6.2 anymore. But I became smarter as well. As you get older, become a little slower, you adjust. You’ll still be able to steal a lot of bases, but you have to adjust your times, and the pitcher’s times, to where you’re still going to be successful. You have to be smart. You’re not the same person that you were before, so you have to adjust to certain things. You’ve worked with some great base stealers, including Rickey Henderson. Who’ve been the ones who’ve influenced you the most? It’s not even so much conversations about base stealing. But back when I was in the minors, my dad had a videotape of Rickey Henderson stealing bases. There are other guys that stole there, too. But the label on the top of the tape just said “Rickey Henderson.” I would put it in, and I would try to figure out how to steal bases. I didn’t really learn as much dealing with the pitcher, and times, until I got up here. The thing I learned from the tape was just the proper technique of trying to take off. Or getting back without having to dive all the time. It must hurt to keep diving all the time, no? It’s just tiring. The pitcher picks over four times and you’re just diving and diving, you get up, and you have to get back up there in terms of being ready to steal. Now, I rarely have to dive. I just get back sideways. So I learned a lot of things from that tape just on going, and also on getting back. And as I’ve gotten older, I’ve learned how to read the pitchers and how to know myself better. It’s a different game now than it was in Rickey’s time, of course. More three-run homers, you get second basemen who weigh 220 pounds. Do you feel teams should be running more than they are, even though the game has changed? You always want to have a couple of guys in your lineup capable of stealing bases. It puts pressure on the pitcher to throw more fastballs. It give your team better pitches to hit, so that those guys who are 220 pounds can pop ’em out. You’ve got infielders moving, it creates pressure on the outfield. It changes up the game. Just like Miguel Cabrera’s power, on a windy day, outfielders will be, “Oh, gosh!” But I think it’s a little harder in this era to steal bases, just because people use the slide step a lot more. Management is a little more crafty with pitching out, switching up different things. Not taking anything away from that era, but the higher a leg kick a guy has, the easier it’s going to be to steal a base. And in this day and age, you don’t get as many of those guys as you did back then, with the super-high kick. You might not have any Miguel Cabreras on the team, but the A’s hit for some power last year. Is there anybody on your team where, if he’s at the plate, you’re not going to run as much? Do you ever worry about distracting the hitter? The only time that I won’t run is with two strikes and I’m on second base. I don’t like people to run when there are two strikes on me. I like to be focused on the pitcher, and when I see somebody take off out there, it changes my mind just enough to not have that full focus on hitting. They can play me way back with two strikes, doesn’t matter how many outs there are, I’m not running. But it doesn’t matter who’s at the plate, to me. The only thing that matters is the game situation. That whole thing about not making the first or last out of an inning at third base … will you never, or rarely, run if you’re on second with nobody out, or two outs, because of fear of getting caught? Well I’m always trying to make sure I don’t get caught. But even more so, I guess, in those situations. So I want to make sure that it’s 100 percent that I’m going to make it. So if it’s Betancourt, yes. [Laughs.] Yeah, Betancourt. I’m going to take that base. But you know, they say don’t make that last out at third base. If you steal third with two outs, though, now the pitcher might be a little more wary of throwing that really sharp breaking ball. So you might not get that best pitch, that sharp one that would strike you out. Instead you might get a timid one and get a base hit. There are always benefits to moving up a base.